Istanbul Bosphorus Cruise Tours, considered as one of the most entertaining activities in Istanbul. Ottoman Sultans moved from the traditional Topkapı Palace to modern Dolmabahce Palace in 1856. 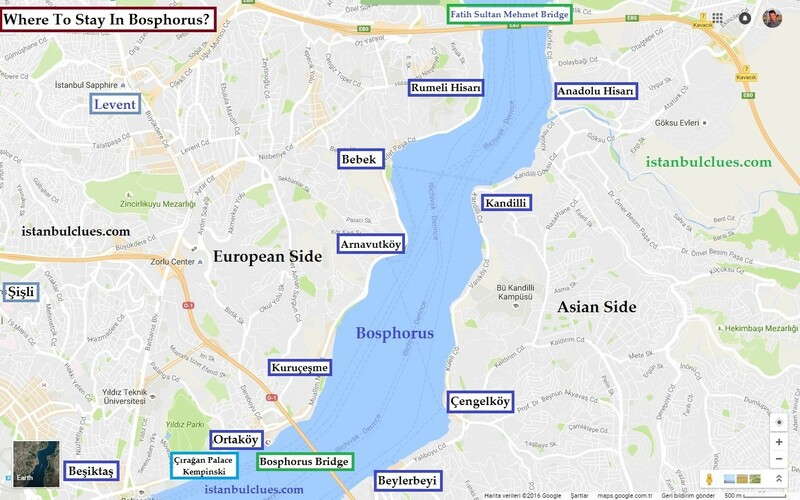 Bosphorus has been the most popular settlement area in Istanbul since then. Bosphorus has a countless number of historical houses called “Yalı”, palaces, mansions, citadels and mosques. Ortakoy, Bebek, Rumeli Fortress are the most popular spots to see during the Bosphorus Cruise journey. 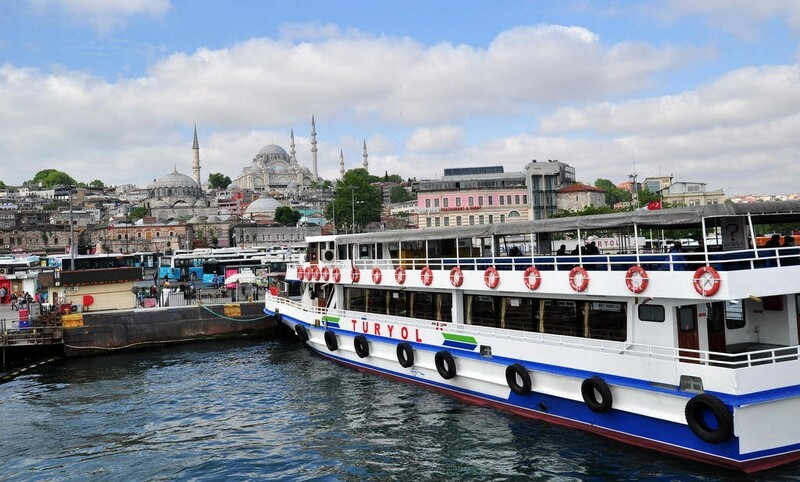 Sehir Hatlari Vapuru (Official Government Ferry) and Turyol Daily Bosphorus Tours (Private Company) will provide you the cheapest and most efficient tour options. Sehir Hatlari has long (6 hours) and short (2 hours) tour options. 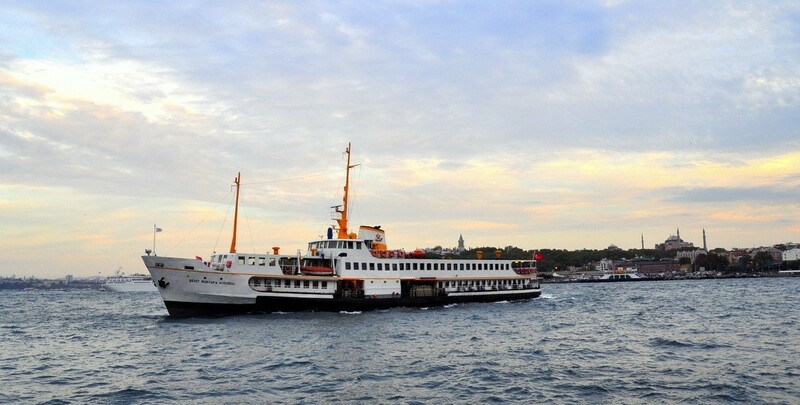 Sehir Hatlari offers large ferries with comfortable decks to take photos and look around. However they have a strict timetable. That could cause you seek some other options. When you need an alternative to Sehir Hatlari Ferry. There is a private company that is called Turyol. This company has nice boats. They are considerably smaller than the Official Sehir Hatlari Ferries but they are very often. You may catch one of Turyol Boats without worrying about timing. Because the boats set out for a journey on the Bosphorus each hour. Duration of the tour is 1,5 hours. 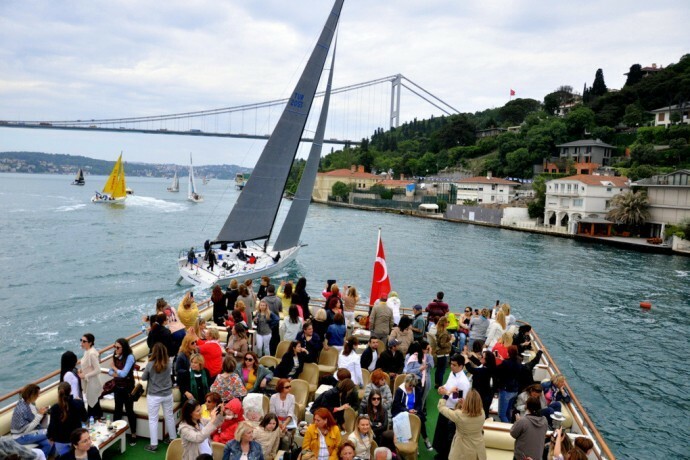 The nostalgic boat begins the tour at 10:35 at all seasons and takes you to the Black Sea shore weaving through both European and Asian side of Bosphorus. After a ride for 1.5 hours, you will have three hours of free time at Anadolu Kavagi stop. During this time, you may take a walk in the cute town, have a lunch and walk up to Yoros Castle to take pictures of the Black Sea and Bosphorus. The boat leaves at 15:00 to take you back by going through the same stops. When your tour ends at 16:30, you will have had a great full day Bosphorus tour at a great deal. Sehir Hatlari Long Bosphorus Tour ticket price is 25 Turkish Lira for a single person. 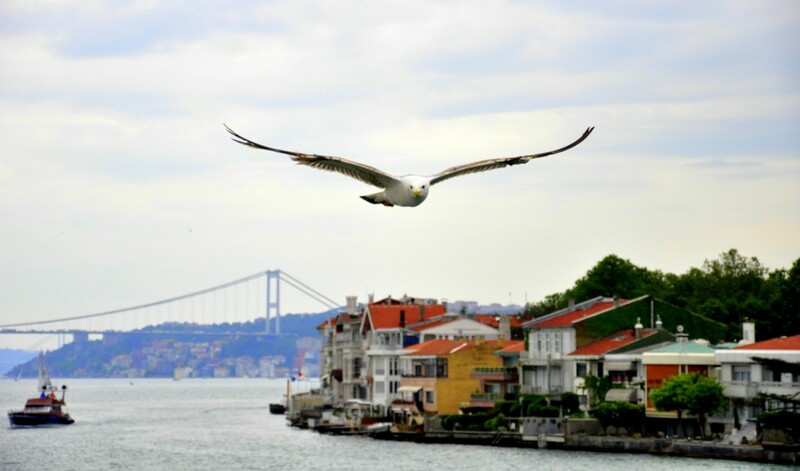 You will see the most important attractions in Bosphorus with this two hours tour. The settlement in Bosphorus area extends only to a certain area on the north. Therefore the Short Bosphorus Cruise should be enough for you to see the important palaces, mansions and citadels. 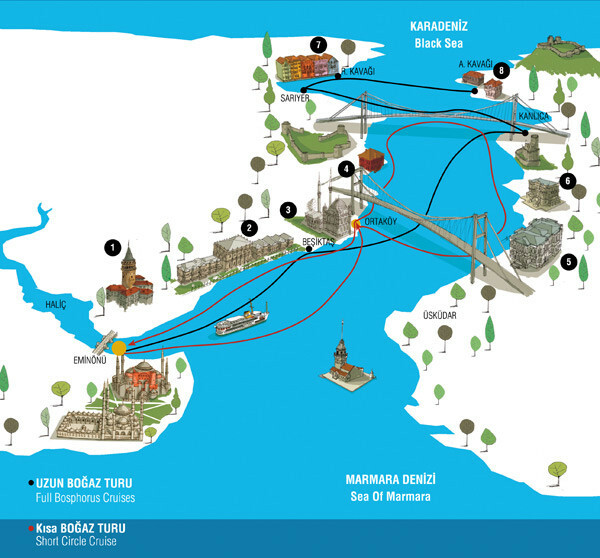 Short Bosphorus Cruise journey costs 12 Turkish Lira for a single person. Turyol’s cute and small boats are good alternatives for an enjoyable Bosphorus cruise. 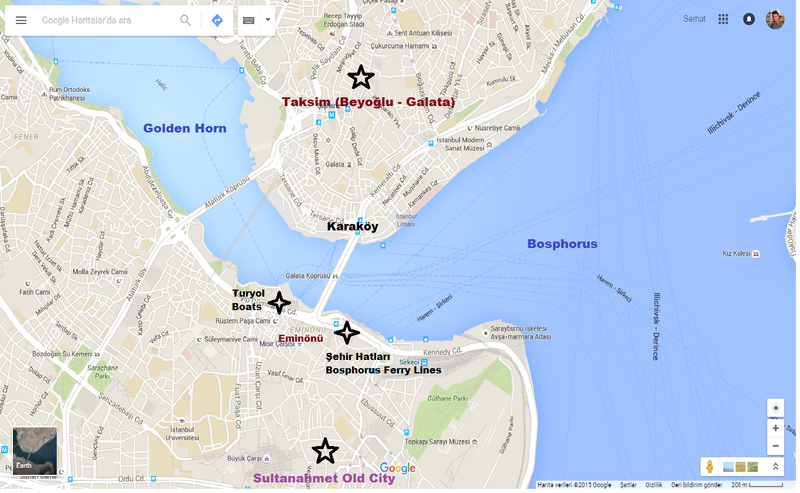 The biggest advantage of Turyol over Şehir Hatları is that Turyol Bosphorus tours start at 10:00 a.m. in the morning. Do the same tour each hour. Tours last from 10:00 O’clock in the morning till late evening. Boats start the journey from Eminönü pier. The boat will simply take you up to the second bridge of Bosphorus, named Fatih Sultan Mehmet Bridge and they take you back to the begginning point (Eminönü). This route is a bit shorter than that of Şehir Hatları Line’s though. Except for the nice seaside mansions of Yeniköy which is ahead of the second bridge, you will see all the beauties of Bosphorus with this tour. If you have limited time or don’t want to be restricted by Şehir Hatları Line’s fewer number of daily departures, Turyol would be a great choice for Bosphorus cruise tour. The cost of Turyol Bosphorus Cruise Tour 20 Turkish Lira for a single ticket. Turyol boats go as far as to FSM Bridge at the top. To get the most out of one day: I would recommend you the Half Day Private Walking Tours in Istanbul. You can start with your guide in 09:00 in the morning. You may visit the listed places. (Hagia Sophia, Blue Mosque, Basilica Cistern, Hippodrome). The duration of this tour is aproximately 4 hours. When you finish the Half Day Guided Tour, your tour guide can take you from Sultanahmet (Old City) to Eminonu Ferry Stations. Then you could choose either Turyol Bosphorus Boats or Sehir Hatlari Short Bosphorus Tours to enjoy the beauty of Bosphorus. Bosphorus Cruise Tours In Istanbul, Yeniköy. Hello explorer of Istanbul! This is Serhat Engul. I am a licensed tour guide in Istanbul. I offer private guided HALF DAY TOUR which includes a visit to the Hagia Sophia, Blue Mosque, Hippodrome, Basilica Cistern and the Grand Bazaar. This is a fantastic option to see some of the iconic landmarks in the whole of Istanbul and you’ll receive plenty of background information on each location to enlighten you. You may see the details of this tour on the HOMEPAGE of the blog. I wish you a wonderful trip! Thanks for all your posts! They have been very useful in planning my trip. Very big help in deciding a lot of things. Complemented very well my Tripadvisor and Lonely Planet research. Hello Ryan, thank you very much for your kind words. This is a good motivation for us. I Hope you will have great time in Istanbul. Istanbul Clues travel blog is designed to provide the local expert advice about history, museums, culture of Istanbul. Author of this blog, Serhat Engul, is a licensed tour guide based in Istanbul. Serhat Engül collaborates with Turkland Travel. Turkland® is a member of Association of Turkish Travel Agencies (TURSAB). License number 4718.